There is a birthday coming up in a couple of day’s time and you want to gift a handmade, since your friend is a craft-lover and a crafter herself. There is total chaos going around you, at home and in workplace, since you have relocated recently. And worse, you can not locate / yet to unpack, all of your craft supply. You look up the net for something pretty-yet-simple-yet-a-quick-one and the ones you can locate is not exactly what you have in mind. You are slowly getting towards your tether’s end, as you do not want to be late for sending the gift! So what do you do, close your eyes and conjure up a simple basic design which matches your above-mentioned criteria. Then hunt out the available yarns and select what you had in mind and after a few frogging here and there……..you are there!! And you are happy with what you have made! No, it would not be masterpiece and not a top-of-the-designer-line thing, but it matches the conjured images and serves the purpose! And that’s exactly is the story behind Jaldi Clutch. It’s small clutch purse about 9” x 5.5” in dimensions, where one can keep the notions and it can be carried around with the craft in hand. Or if you are going out in a hurry to pick up some essentials from your neighbourhood grocer, your house-keys, mobile and wallet will fit in comfortably. And it gets done in a jiffy hence the name Jaldi (Jaldi is a Hindi/Urdu word which translates to Quick, yes plain and simple quick!). 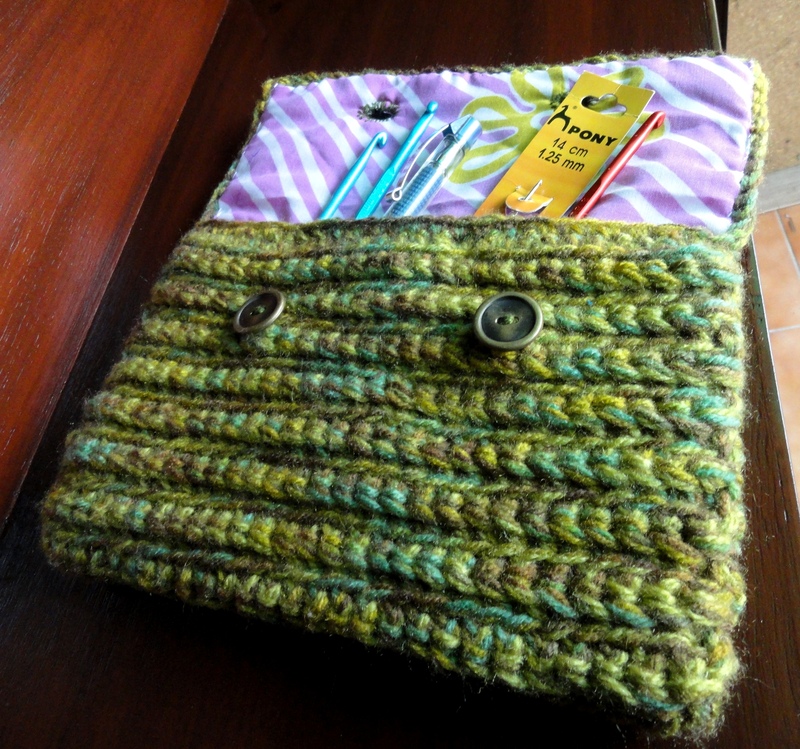 DK wt yarn of your choice, the clutch is crocheted with 3 strands held together. I used Vardhman acrylic DK Varigated in shades of green two strands and one strand of Vardhman Millenium acrylic DK in fresh leaf green. Three strands of DK gives the clutch a fabric which is firm yet quite squishy. Fabric for lining, matching thread. Foundation row – sc in second ch from hook. Sc in each ch after that till end (28 scs) Turn. Pull the loop on the hook a little high say about 1-1.5 cms. (I did this and avoided the turning ch, which with such thick yarn would have given a bunched look and added some undesirable mass at the edge.) The last st in every row is to be pulled up like this. 1st row – sc in flo of first st of previous row. Sc in flo in each st thenafter till end. Turn. Repeat Rows 1 and 2 till the piece measures approx 13.5” from beginning, ending with 2nd row (sc in blo row). Next row – 7 scs in blo in first 7 scs, 2 sc in the 2 chs, 10 sc in blo, 2 scs in next 2 ch, 7 sc in blo . Turn. Repeat 1st and 2nd row twice more, ending with a 2nd row. Do one row of reverse sc as the last row. Give the clutch it’s form, by folding it at 5.5” from one end of the flat piece and folding the other end over it as the top flap. 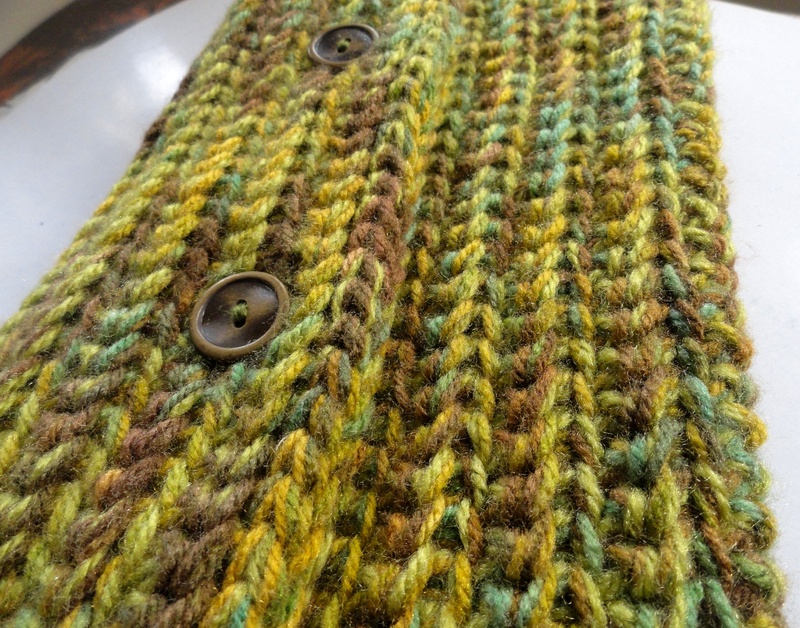 Join the two sides with single strand the same yarn used for the clutch with stitch of your preference. Line it with a matching fabric. Cut two horizontal slits in the fabric for the top flap in appropriate place against the buttonhole that you have made and secure it with buttonhole stitches. I hand stitched the edges. Attach two buttons of suitable size on the inside flap which will be covered by the top flap, in appropriate places against the buttonholes made. Put you notions, craft scissors, pen, keys etc inside and your Jaldi Clutch is ready for use!! !